Denture, also known as false teeth, is a replacement option for missing teeth. It can be taken out and put back in your mouth. Dentures are more common than you think. When Clark Gable said his famous line “Frankly my dear, I don’t give a damn”, it was through a set of dentures. Winston Churchill and Whitney Houston also wore dentures. Even Emma Watson wore dentures for the second Harry Potter movie to hide the loss of some baby teeth during filming. There are two type of dentures: full and partial. 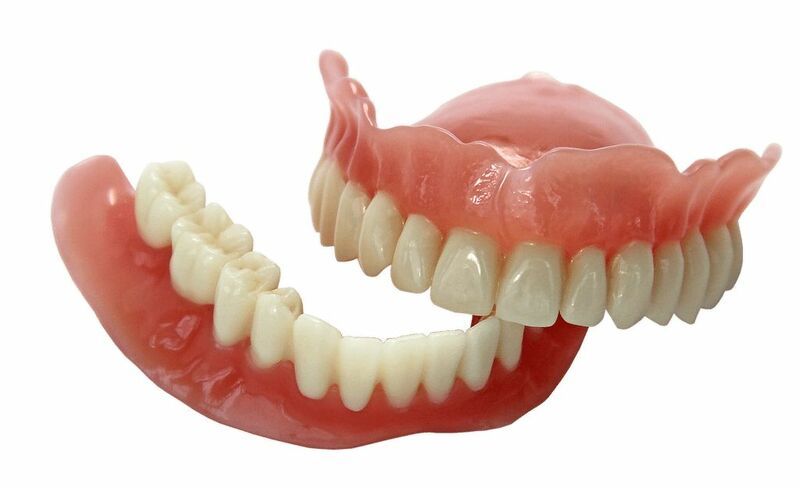 Dentures could be made of a variety of different materials. Your dentist will be able to advise what might be the most suitable for you. In the past, it was very common to have a tooth extracted as soon as there was a problem and replace them with false teeth. Modern dentists understand the importance of natural teeth and will often recommend anything that’s necessary to keep them. However, people might still lose teeth during their lifetime. The most common reasons for tooth loss are due to uncontrolled periodontal disease or extensive decay. Sometimes teeth also need to be extracted due to trauma or genetic defects. Not everyone will be missing the entire set of teeth, however even missing a few teeth could have significant impact on your chewing, speech and appearance. For example, missing a few front teeth could result in less support to your lips and cheeks, and this could cause facial muscle to sag. Loss of teeth could also cause the neighbouring teeth to tilt or drift into the space and disrupt the balance of your bite and overload your remaining teeth. People also often lose confidence or become self-conscious if their smiles showing multiple big gaps. Complete Dentures – If someone is missing all the teeth in the upper (maxillary) or lower (mandibular) arch, they may receive a complete set of dentures to replace all missing teeth, also known as full dentures. Partial dentures – As the name suggests, partial dentures are used when a few teeth are missing. Partial dentures get supports from both your natural teeth and the gums. Implants retained dentures – implant supported dentures (or all-on-4) provides a solution in extremely challenging situations, when there is little or no bone to support a denture, or when a patient experiences very loose and wobbly dentures and would like improvement of retention. Such dentures are retained by dental implants which are placed surgically inside your jaw bone and will be able to withstand considerable biting force and holds the denture in position. Immediate dentures – When a few front teeth are planned to be extracted due to various of reasons, we would recommend immediate dentures for social and functional requirements. The dentures will be made prior to the teeth extractions, and will be inserted on the day of extraction, the patient would not need to hide at home to wait for healing to take place, as the teeth will be replaced on the same day. However, the healing process may cause your gum and bone to shrink in a few months, therefore immediate dentures will usually require reline or adjustment in a few months’ time. Occasionally, a complete new set might be necessary. It could take a while for you to get used to your new dentures, especially if you have not worn them before. They might feel uncomfortable or even loose while your muscles in your tongue and cheek are learning to keep them in position. You do need to retrain your muscle and gradually learn to speak and eat with your new dentures. For speaking, you could try some practice of speaking difficult words or read out loud from books or newspapers, until you feel more comfortable. As for eating, you will need to start with bite-sized pieces and softer food, and gradually introduce other foods that requires more chewing. In most situation, we recommend leaving dentures out at night when you sleep to give your gum and muscles some rest, this will also help to prevent potential fungal infection on your gums due to prolonged denture wear. Taking care of your dentures will optimize its lifespan and reduce unwanted bacteria build-up. Try to use medium toothbrush with mild soap and water or denture paste, always avoid using toothpaste as it may abrade the delicate fitting surface of your dentures. You need to make sure you brush all surfaces of your dentures. The best method is to brush, soak and then brush again. Brush first to remove any food particles or debris. Then remove stains and freshen the dentures by soaking in an effervescent denture cleaner. Finally, brush the dentures again as you would your own teeth. Always be careful not to scrub too hard to avoid damaging the surface of the dentures. Also, try to clean your dentures over a soft surface such as a folded towel or cushion so they don’t break if you drop them. After wearing your dentures for some years, especially in the case of a full denture, you may start to find that the dentures become loose or worn. This is the result of constant changes of shape to the underlying bone and gums, this is a normal physiological process after teeth loos. Ill-fitting dentures might be very uncomfortable to wear and challenging to function with. Therefore, it might be necessary to modify your existing denture or even having a new set made. The cost of dentures depends on several factors, whether its for upper or lower, complete or partial, number of teeth missing, and materials you choose. If you have private health insurance, you might be able to get some rebate from your health fund to cover part of the cost. We offer NO INTEREST payment plans to help you smile today and pay later. Ask your friendly team to assist you if you would like more information on this. Contact us now to find out more information on this. Our experienced dentists would be happy to assist on any questions you have.